And just when I thought it couldn't get any easier, I was introduced to Chef Shamy Butter. I was sent the Garlic Butter with parmesan and basil, and I knew right away I wanted to use it for corn on the cob. I added about a tablespoon to each packet. Absolutely delicious. When a crazy day threw my dinner plans out the window, I melted it, dipped boneless skinless chicken breast into it, which I then dredged in seasoned panko crumbs and baked. Clean plates all around. It also makes great garlic bread! I've got another great recipe on Friday using the Chef Shamy Strawberry Honey Butter. If you'd like to order some, check out their site here, and if you enter the code 10Butter10 at the checkout, you'll recieve 10% off through July 4th, 2018. Don't forget to enter for your chance to win the prize pack from Chef Shamy and the other #CookoutWeek sponsors below. For info on the prizes, click here: Cookoutweek welcome post and prize info. Rip off squares of heavy duty aluminum foil, making sure they are large enough to completely enclose corn. Lay an ear of corn on the foil and add 1 tablespoon of the garlic butter. Bring ends of foil up and fold over until it is secure. Twist the ends of the foil and fold them upwards. Place in slow cooker. Repeat with remaining ears. Add water to the bottom of the slow cooker until it is about 1" deep. Cook on high for 3 to 4 hours, until the corn is tender. Carefully open packets, place corn on serving plate and pour any excess butter over the top. Sprinkle with additional parmesan cheese, if desired. I have never tried cooking corn in the slow cooker. I'll have to give it a go. I love that you can make these in a slow cooker! So much easier!! Especially right now when it's so hot I don't want a giant pot of boiling water on the stove! I have the butter... I have a slow cooker.... I need some corn asap! Drooling! 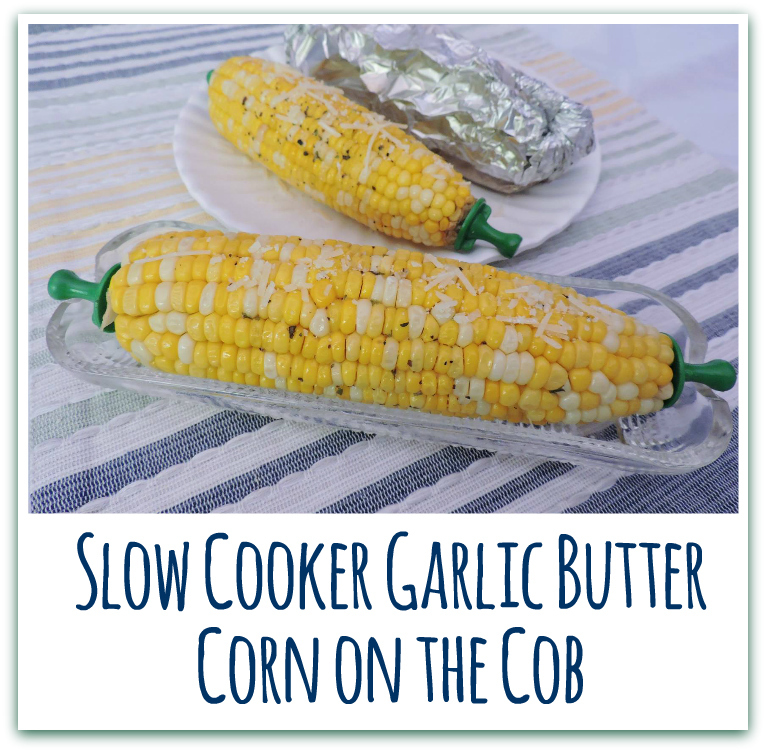 I love cooking corn in a slow cooker...so easy and yummy!!! 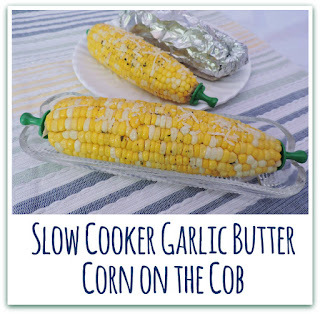 I've never cooked corn in a slow cooker, what a great idea and perfect for a crowd!